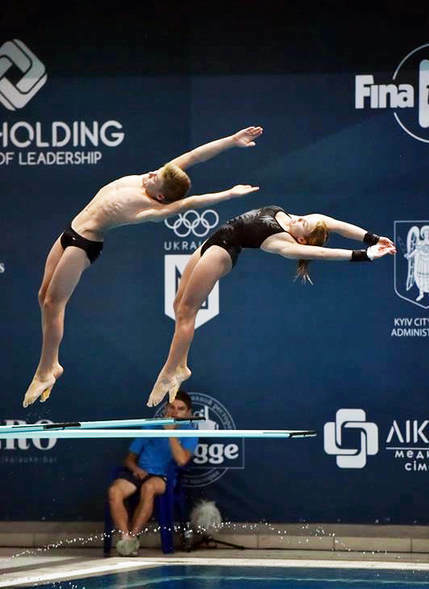 In mid-July 2018, five young junior divers embarked on an adventure of a life-time to compete at the FINA World Junior Championships in Kyiv, Ukraine. Nathan Brown (18), Frazer Tavener (17), Holly Morse (14) and Luke Spikes (14) all from Auckland Diving were joined by Arno Lee (13) from Wellington. Also travelling was Auckland coach Steve Gladding and Wellington’s James Hardaker. First stop was London, where the team was based for four days to train at Olympic Park alongside the British team. What a time it was; everyone enjoyed the amazing facilities including the incredible pool built for the 2012 Olympic Games, and the dedicated well equiped dry-land area. As well as training, there was time to do a whistle-stop tour of London’s main tourist sites. After a great week of training, the team flew to Kyiv, the capital city of Ukraine. ​Greeted at the airport by our hosts for the week, the team headed to their hotel, conveniently located as part of the competition pool complex. Ukraine were fantastic hosts and the extremely well organised competition made for a fun time. An opening ceremony extravaganza was followed by nine days of competition involving 240 athletes from 49 countries. Our athletes did extremely well in what was a very competitive field, and the experience of diving at top level under pressure was a valued learning experience. The atheletes made new friends and returned to New Zealand after a successful two weeks on tour, all of them eager to train hard towards their next international competition.